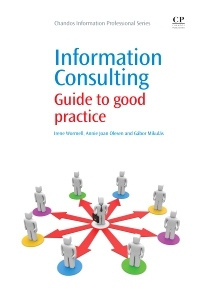 Chapter 1: What is information consulting? Finances: are the necessary resources in place? Can you tolerate a slow ramp-up? Should you work part time or subcontract? Are you a consulting personality? The request for proposal (RFP): to bid or not to bid? Preliminary discussions: what, exactly, are you selling this time? Do you take the money and run when what the client requests disagrees with what you believe is needed? Information Consulting presents a closer look at what makes information consultants successful and how they develop a productive relationship with their clients. While most of the books on this subject area are providing the experiences of information consulting veterans on ‘how do you really do it?’, the aim of this book is focused on exploring the nature of information management consulting. This includes the task of the advice-and-guidance variety, such as helping clients to analyze and solve problems or to meet opportunities with the element of ‘What should I do?’. The authors have used their extensive international and professional networks to take the challenge of letting the clients speak about their experiences and expectations in hiring information consultants. Irene Wormell is a Professor of Information Management in Denmark and Sweden. She has undertaken research and consultancy with a wide range of organizations globally and is part of an extensive international professional network. During 1982-2008 she acted also as consultant in her own company Informatiker Konsult AB in Sweden. Currently she is working in association with the Danish trend analytical bureau Firstmove A/S in Copenhagen. Annie Joan Olesen, is a Director at A9 Consulting in Denmark and leader of the Ability Europe Ltd., Denmark Branch. She is an experienced consultant with a track record of high quality research and deliverables in national, international and EU engagements. With a focus on preparation, presentation and management of numerous international, national and regional projects with a particular strength of accessing a core network of experts having an excellent knowledge of the PSI market across the EU. Gábor Mikulás is a Director at GM Consulting in Hungary. He has many years experience in working as information broker and consultant. Mikulás is President of the Association of Hungarian Information Brokers (MIBE) and Publisher of the KIT Hírlevél (Library - Information - Society Newsletter), a free weekly electronic paper for information and library professionals.